« 8th Ethiopian Diaspora Business Forum to Be Held in D.C.
Washington, D.C. (TADIAS) – On Sunday, July 14th, I had a chance to attend a book signing and discussion highlighting Dr. Samuel Wolde-Yohannes’s newly released book Ethiopia: Creating a Culture of Progress. Dr. Samuel, who has previously written several philosophy books, is currently a professor of philosophy at Mount San Antonio College in Walnut, California. 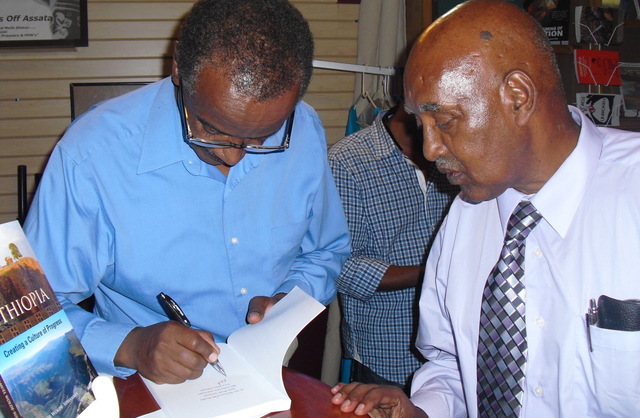 The book signing was held at Sankofa Books in Washington D.C.
Below is Tadias Magazine’s interview with Samuel Wolde-Yohannes. TADIAS: Why did you choose to write about culture? Dr. Samuel: Well, why culture? I chose culture because culture is a foundation on which we build our economic, political and social institutions. Most of the discussions that have been going on so far in Ethiopia, or outside Ethiopia, have focused on disciplinary concepts. That means, If you are an economist, you discuss economics, if you are a political scientist, your approach for Ethiopia’s problem is from that perspectives and so on. But what ties together all these is really the notion of culture. The purpose of this book is not to ignore these particular approaches and results but to go beyond them. In other words, to go deeper to every core of the problem. Thus the main thrust of the book is the analysis of the Ethiopian culture as the basis of all the problems plaguing Ethiopia. TADIAS: Are you saying that there is a need of cultural change? How about those who argue the opposite? Dr. Samuel: Whether we like it or not, culture changes. The question is how to direct it to become more productive rather than simply adopting western culture. It is really about guiding it. I wouldn’t say complete overhaul of the culture. No. I am completely against that, but there are some aspects of our culture, some features of our cultures that need to be addressed. I have outlined these in the book. I can say that I cannot discuss all elements of culture. It is impossible. And the subject is open to debate. But if we don’t start to address it we will continue to have the same old political institutions; we would have the same approach to economic and social problems of our country. TADIAS: How do you view the impact of globalization on culture? Dr. Samuel: Globalization. It is a very good point. Because globalization is going to affect all cultures whether we like it or not. It is a reality that we have. If you have strong culture, then that is what I am really wishing for, we can maintain our culture. TADIAS: How do you view religion and culture in the context of Ethiopia? Dr. Samuel: Religion plays a fundamental role in Ethiopian culture, whether it was during the time of Emperors or the Derge, or even today. Because fundamentally Ethiopians are religious people. There are a lot of religious attachments. So you cannot really divorce the discourse of religion from the discourse of culture. TADIAS: How do we address the dominance of some cultures over others in a diverse society like Ethiopia? Dr. Samuel: Well that’s a reality. It is a reality that we have to come to grips with. Because the Ethiopian highland and Tewahedo Christians has been dominant in Ethiopian cultural discourse. It doesn’t mean that there are no other cultures, but which one is the dominant in terms of discourse. That is where my focus is. In my view that’s where the problem starts. That is where the solution starts. The book is not intended to support or undermine the current political debate, but to simply bring Ethiopians to openly discuss about what needs to change and what needs to be preserved in their culture. For those interested in purchasing the book, it’s on Amazon.